Standing beside a booth sticky from nights of shot pitchers and beer specials, Steve McCalley asked a room full of diners and drinkers if they could differentiate between the names of characters from “Game of Thrones” and players in the National Football League. With Maroon 5 playing in the background, teams of four huddled around plates of fries and glasses of beer as they discussed their selections. The debate didn’t last long, and as the pop music filtered through top hits, the atmosphere at the bar shifted from intensely competitive to laid-back conversation and back again several times over the two-hour trivia night. The questions were part of McCalley’s weekly trivia series at Hemingway’s Cafe on Forbes Avenue. During pub trivia, on Monday nights at 6 p.m., McCalley starts each session with a round of questions concerning an “either/or” scenario. Before starting the first round, he rambles off a list of rules for the players: he will read aloud over their shoulder if teams are caught looking at their phones for an answer and the “quizmaster is always right.” At the end of each round, McCalley tells teams they must “nominate the biggest pushover” of their group to deliver the sheet to him and his partner for scoring. In Oakland, the trivia scene is dominated by Hemingway’s Cafe, Gene’s Place and Stack’d, with the three bars offering a total of four chances to participate in the quiz game each week. Although trivia nights are nothing new to local bars, many bartenders and trivia hosts agree the trend has gained popularity over the past few years, and even more over the past few months. With a range of questions — either organically made by the quizmasters or provided by a company — times and food specials, all three bars have noticed an increase in customers on these notoriously slow weekdays. McCalley has been the quizmaster at Hemingway’s since August 2015 when he started its pub trivia nights — with topics ranging from sports and history to science and politics. McCalley hosts regular pub trivia Monday nights and music-focused trivia each Wednesday from 6 to 8:30 p.m. When he started out two years ago, music nights often only had four teams of four participants. Now, in a regular week in April, there are about 22 teams of four. While Stack’d manager Nathan Drum said the restaurant gets about seven teams each week, Gene’s usually sees about 20. When Harrison Kinzler, 27, came to Pitt in 2012, he said the trivia options were sparse. Pittsburgh Cafe, which stood on Meyran Avenue, and Pub 19, formerly on Atwood Street, offered trivia — but Kinzler was underwhelmed by the choices. Kinzler, a 2015 Pitt alum and frequent customer of Gene’s Place on Atwood Street, approached owner Gene Ney about starting their own trivia night. Now, about five years and 259 trivia nights later, Wednesday night trivia is one of the most packed nights for the bar. Kinzler said the heyday for trivia was about 2014 when they sometimes had to turn people away because they had reached max capacity. Kinzler said Gene’s newly-earned reputation as an over-crowded bar sometimes turned potential customers away. “[In the] last two years, it’s really taken off. It sounds cliche, but the quality of the trivia is really good, I think it’s evident they put a lot of work into it,” Anthony said, referring to how Kinzler and his partners create each question themselves. With about 20 teams per night, the customers at Gene’s Place fill any available space in the tiny bar, making it nearly impossible to get a drink or have a conversation that doesn’t center on a possible answer. As the Pirates’ game plays in the background, players cram to see the television screen displaying the trivia questions and the announcer proudly displaying each answer and the team standings. While Kinzler mans the mic, Ney passes out drinks, smiling at each customer even as they fight their way for a spot at the bar. Hemingway’s Cafe joined Gene’s on the trivia scene in August 2015. About six months later, Stack’d, which opened that same August, started its own trivia night on Mondays at 9 p.m.
At Stack’d, the restaurant chose to pair trivia night with the restaurant’s half-off chicken finger special. Nathan Drum, general manager at Stack’d, said the game usually has about five to seven consistent teams each week with a few extra diners joining haphazardly. Like many bars in the area, Hemingway’s first started trivia with a similar goal in mind. 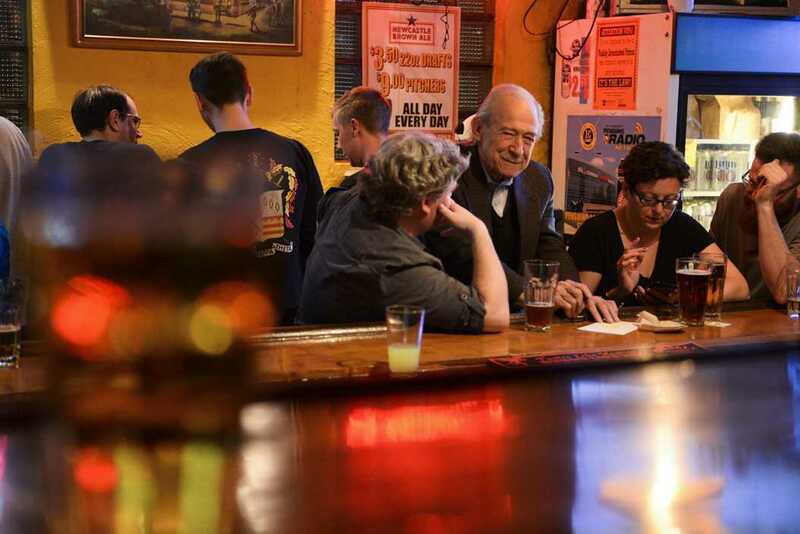 In the three years it’s offered trivia nights, Hemingway’s owner John Elavsky said attendance has “ramped up every year” with even more of an increase in customers this semester. “We tried it, and it worked. You get two more tables a week [than usual] and that’s OK, you got a win there,” Elavsky, who has owned the bar for more than 20 years, said. Katie Keenan, general manager for Hemingway’s, said the trivia nights took a while to catch on, but word of mouth advertising has led to a steady stream of customers both nights. The time, she said, also caters to a different group of people, often more focused on dinner and relaxed drinking than the usual weekend crowd. Both Hemingway’s and Stack’d use Buzz Worthy Pub Trivia, a local trivia company, to run their game nights. The trivia company sends a quizmaster to the restaurant fully equipped with questions, microphones and scorecards. The company, which is a similar model to other trivia companies around the nation, provides its announcers with a range of questions. Since many quizmasters host trivia as a side project or a hobby, the idea is that trivia companies can put more thought and time into making the questions, according to Geeks who Drink, a national pub trivia company. Buzz Worthy Pub Trivia started locally but has since expanded slightly beyond Pittsburgh city limits. The company started doing trivia at a family-owned bar, Hough’s, in Greenfield. When it wanted to expand, the owners asked regular customers, including McCalley, if they would want to act as hosts for the venture. Yet, McCalley took the gig at Hemingway’s in August 2015 and hasn’t stopped since. At Gene’s just a bit deeper in Oakland, the crowd jumps to answer questions ranging from the last word of the Bible to Africa’s first and oldest modern republic to which U.S. senator spoke for 24 hours and 18 minutes to record the longest filibuster ever. Kinzler said the questions come from all different places: straight from Wikipedia, various trivia books or whatever thoughts pop into his head throughout the week. One loyal customer, Sid White, who hasn’t missed a game of trivia yet, gifted him the New York Times “Encyclopedia of Everything” for further inspiration. Whether asking about baseball, the periodic table or pop culture, the same chorus of responses can be heard Monday and Wednesday throughout Oakland: lots of “oh mans,” shouts of happiness and moans of regret. Whether playing or announcing, McCalley said trivia hasn’t lost its appeal and the atmosphere of the game is something that will always draw him in.